Virat Kohli’s India succumbed to a first ever home loss after their defeat to England by 5 runs in the third ODI game in Kolkata. Earlier, with the help of half-centuries from Jason Roy, Jonny Bairstow, and Ben Stokes, England scored 321 runs, after being asked to bat first by India. After winning the toss, Virat Kohli chose to field first owing to the fact that the Eden Gardens pitch had a tinge of grass on it. 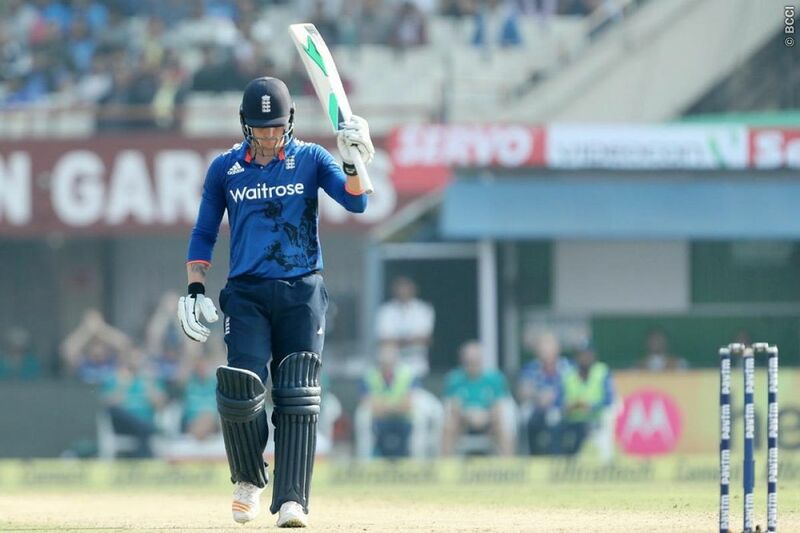 However, powered by a strong batting order, England made a great start courtesy of a 98-run opening stand between Jason Roy (65 off 56 balls) and Sam Billings, who scored 35 runs on his comeback to the ODI team. In the first powerplay, England had put up 43 runs on the board, their lowest in the series so far. The Indian pace duo of Bhuvneshwar Kumar and Hardik Pandya made the good use of the bounce and movement on offer right from the beginning as Roy, who was trying to settle on the testing wicket, was beaten twice by the extra bounce in the very first over. Billings, who appeared leaden-footed at the start of the innings, smashed three boundaries off Pandya as England started imposing themselves on the game. Pandya, fought back by maintaining constant line and length to deny too many scoring opportunities. Due to the lack of wickets, Kohli introduced Jasprit Bumrah as early as the seventh over to keep the batsmen in check but the openers has settled well and managed to find the gaps with ease. It was the introduction of left-arm spinner Ravindra Jadeja, who dismissed both Billings and Roy in quick succession, that restricted England to 110/2 at the end of 20 overs. English skipper Eoin Morgan and Jonny Bairstow, who replaced the injured Joe Root, took singles to keep the scorecard ticking. Bairstow got a reprieve when he was caught at third-man, but replays suggested that Bumrah had overstepped the crease. To add to India’s misery, Morgan dispatched the free-hit over long-leg for a six as the duo brought up their half-century stand off just 60 balls. Just when the Englishman looked comfortable in the middle, Pandya finally got the better of Morgan, who flicked the ball straight into the hands of Bumrah for 43. Jos Buttler’s stay at the crease was a short one as he was sent packing by Pandya while looking to hit through the covers, leaving England at 212/4 after 38 overs. Ben Stokes went down the track time and again to negate Bhuvneshwar Kumar's bowling in the death overs to take the score past 300. Stokes plundered four fours and two sixes to complete a 34-ball half-century that took England’s score to 321/8 in 50 overs, leaving India to chase the second highest total at the Eden Gardens. Making his return to the One-day side, Ajinkya Rahane was expected to push his case for the Champions Trophy squad with a good performance but he was troubled by the English pacers before getting cleaned up for one by a ofDavid Willey full delivery. India’s opening woes continued yet again as Rahane’s partner KL Rahul failed to get going and got out for 11 to Jake Ball delivery leaving India at a precarious position of 37/2 in 6 overs. The fan’s hope was pinned up on “chasemaster” Virat Kohli, who didn’t disappoint. With a flurry of boundaries to all side of the park, the Indian captain made his intent clear that he wouldn’t let the English bowlers breathe easy. England would have had a sinking feeling again when Virat was dropped on 35 but the Eden Garden’s crowd was stunned when Stokes derived an edge off Indian skipper’s blade, just after his half-century, relegating India to a score of 102/3 in 20 overs. Yuvraj Singh looked to be in good nick as he played some powerful shots all around the wicket and kept the scorecard ticking but in the attempt to increase the run-rate, Yuvraj hit the ball down Billings’ throat at deep mid-wicket. India problems deepened when Dhoni edged a Ball delivery to Jos Buttler, scoring just 25. Kedar Jadhav and Hardik Pandya struggled to get going initially due to the pressure exerted by the English but the Indian batsmen did well to hang there in the middle. Once settled, both Jadhav and Pandya went past their half centuries to bring India back into the match. After bringing India within touching distance of the game, Pandya was dismissed by Ben Stokes with the score at 277/6. Jadeja played a small cameo role as he smashed two boundaries but a rush of blood to the head cost him his wicket with India still 31 runs away from the target. With 16 runs required from 6 balls, Jadhav brought India to six off 2 before he was caught at deep cover and with Kumar missing the last delivery England picked up their first win of the tour.